Our Gift Cards make the perfect gift because they give the gift of choice both in our stores as well as online. For 100 years and counting, Boscov’s has been known for incredible value, the most-wanted brands and exceptional customer service that keep customers coming back year after year. Our stores are packed full of everything you need for you, your family and your home. As the largest family-owned department store chain, we have over 200 departments and 100s of the nation’s top brands – there’s something for everyone! We carry apparel, shoes & accessories for women, children and men. Plus, home products like small electrics, furniture, bedding, domestics, housewares, dining & entertaining, giftware, grills, patio furniture, garden accessories, luggage, toys and much more! We not only offer the best merchandise at the guaranteed lowest prices, we also make your shopping experience enjoyable with our award-winning customer service. Our Gift Cards have no fees and never expire! They can be used at any Boscov’s store; we have more than 40 locations in Pennsylvania, New York, New Jersey, Delaware, Maryland, Ohio and Connecticut. 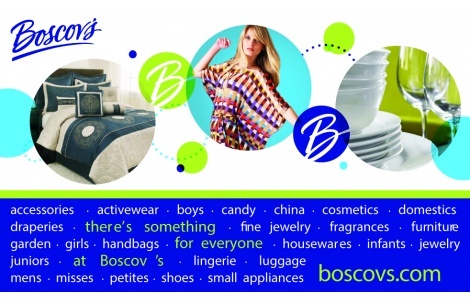 Our gift cards can also be redeemed online at boscovs.com. National Gift Card is the best place for you to order Boscov's gift cards in bulk. We are the experts in all things gift cards and can set up your gift card solutions program for you today. Please contact us for more information on bulk, direct-to-recipient, or individual gift card fulfillment for your gift card program. Contact us here or call us at 888-472-8747 today! Use of this Gift Card constitutes acceptance of the terms and conditions which are available at boscovs.com/giftcardterms and may be updated at any time. For balance information call 1-888-850-9964 or refer to your last receipt. Card is issued by and is an obligation of BPC, LLC and does not expire. This card is redeemable only for merchandise and services at any Boscov’s Store and at boscovs.com. Treat this card like cash, however this card is not returnable and not redeemable for cash (except where required by law) and may not be applied as payment or credit to any account. Lost, stolen or damaged cards may only be replaced for any remaining amount with original receipt. There is no fee for card replacement.